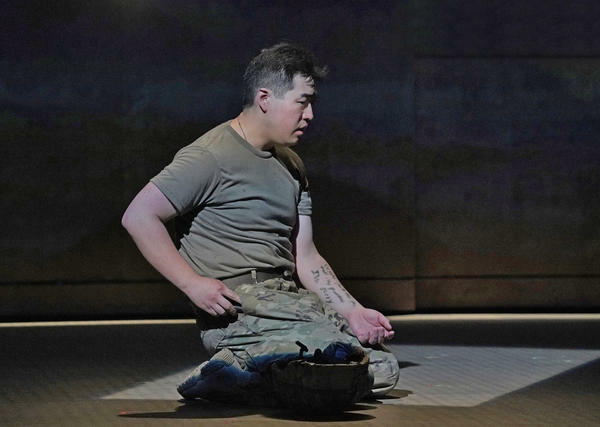 Andrew Stenson as Private Danny Chen, in the new opera "An American Soldier." St. Louis Public Radio's Jeremy Goodwin talks with the creators of the new opera "An American Soldier." “What does it mean to be an American? How do people feel that they earn that, and why are there things getting in their way?” asked Andrew Stenson, who portrays Chen in the opera. Chen was born to Chinese immigrant parents in New York City. He volunteered for the Army and was 19 when he was posted in Afghanistan, where his fellow soldiers pelted him with racial taunts and physical abuse. He was found dead at his post just hours after some of his comrades in arms made him crawl across gravel while they threw rocks at him. Originally commissioned by Washington National Opera, a one-hour version of “An American Soldier” first took the stage in 2014. The production at Opera Theatre of St. Louis is the world premiere of an expanded, two-act version. The librettist is Tony Award-winning playwright David Henry Hwang, a Los Angeles native who has written about the Chinese-American experience. He’s perhaps best known for the 1988 play “M. Butterfly,” a response to the Puccini opera “Madama Butterfly” that upends racial and gender stereotypes. The composer is Huang Ro, a native of China who first moved to the United States for college. He said Asian-Americans can occupy a sort of social limbo — treated as outsiders but often left out of conversations that treat race only in terms of black and white. “We are not mainstream, we are a minority. But also when people talk about people of color, we are not the main focus,” he said. “So we are not qualified to talk about that. So then, who [are we]? We are not mainstream, we are not minority, then we don’t have a voice,” he said. Conductor Michael Christie will lead members of the St. Louis Symphony Orchestra in the performance. The stage director is Matthew Ozawa, who is part of a very small club of Asian-American opera directors. “I’m the only one. I’m the only one who has a visible career. I know of maybe two or three other young, Asian-American directors who are working their way through the system like I did,” Ozawa says. His father was born in a Japanese internment camp toward the end of World War II, a bit of family history that has stuck with him. “The idea of being the other, different, sometimes feeling invisible is sort of saturated into the fabric of my life, which is also a lot of how Danny Chen felt,” Ozawa said. The opera is framed around the courts martial for the eight soldiers who faced discipline in connection to Chen’s death, facing charges including negligent homicide and reckless endangerment. The harshest penalty imposed by the jury of Army officers and enlisted soldiers was 10 months in military prison and a fine. Stenson wants audiences to see this story in a wide context. Earlier this year, the Pentagon ordered an internal review on hazing, which is due on Dec. 1. In New York City’s Chinatown, there is now a street named after Private Chen.